What could be better than following up the Noor-ol-Ain with video footage of the wedding for which it was commissioned? However, if you prefer your charming, late-50s black-and-white footage a bit clearer and in English, I’ve included a forty-second news reel that also gives you a little background on the dynasty’s situation at the time. (See video 1). Either way, here’s some afternoon viewing enjoyment…at least it’s not an “Everybody Loves Raymond” rerun. 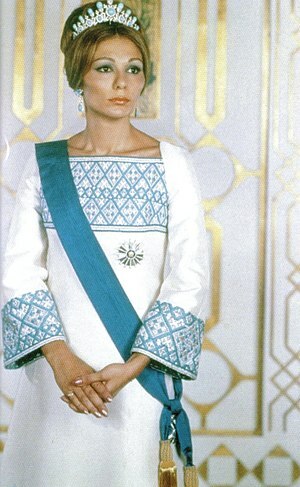 Empress Farah and her legendary Noor-ol-Ain wedding tiara. This entry was posted in persian empire (iran), weddings and tagged persia, tiara, weddings. Bookmark the permalink.